In part 1 of this series on testing trading strategies, we looked at how to test different entry methodologies for a trading system to determine if our entry technique is actually effective. This breaking apart a trading system into it’s components (Entries, Exits and Stops) allows us to test the effectiveness of each component, and therefore improve upon a lacking component as opposed to throwing out an entire system which may have a great entry methodology, but lacks in the profit taking and stop loss methodologies. This article is to outline the testing of profit taking exit methodologies. Testing exits is far more difficult than testing entries. Different exit methodologies will have different results based upon the entry methodology used. There it is usually best to choose and test your entry methodology first before you go about testing your exit strategies. Once you have your entry methodology, to test your exits, you are going to test each exit methodology separately by entering with a single contract or share for every entry signal given, over a specific period of time. Ideally you would like to choose a period of time that contains as many different market type as possible (Bullish Normal, Bearish Volatile, Neutral Quiet) or, even better, test each market type separately to determine what exit works best in each market condition. Static Profit Targets: A exit is set a certain number of ticks (or currency) away from the trade entry price. The idea is to get in and get out with a profit. Trailing Stop: The trailing stop is designed to lock in profits. As a trade moves in your direction, the stop moves to reduced your risk, but never moves against you. This allows a trade that is going in your direction to continue and a trade that goes against you to be exited. Parabolic SAR: While it was designed as Exit and Reversal system that would always keep you in the market, the Parabolic SAR can be a good exit methodology. The idea behind the Parabolic exit is to give the trade enough room at the start, and then as it moves in your favor, accelerate the stop to capture as much profit as possible. Volatility Exits: Volatility exits close a position if the market has a volatile move in either direction, signally an emotional market which can be signals for turning points. If the market has a bar that is greater than 2 * ATR(14), that would signal a volatile move and thus exit the position entirely. When comparing the results from different exit strategies, the most important metric is net profit as that is the most important metric in the end. However you will want to watch the win/loss % and Maximum Adverse Excursion (MAE). Some of your trades may go way against you and then come back for a profit, trades that would have been stopped out of with the use of a stop loss. It’s a way to keep track of the exit’s effectiveness. The exit efficiency gives you an idea if you are closing your trade too quickly. A low exit efficiency % means you are close it too quickly, while a higher percentage means you are doing well capturing the available profit. You can then tweak your exit to attempt to capture more profit with your exit methodology. We didn’t collect Exit Efficiency results as this is not built-in to NinjaTrader. However I’ll be looking to at this to my Additional Strategy Output in the near future. Looking at the results, we can see a few things. First, the larger the space we gave it, the better the exit did. Secondly, the Parabolic SAR had the best % Win rate out of all of them, but also had the worst Avg. Win to Avg. Loss ratio. 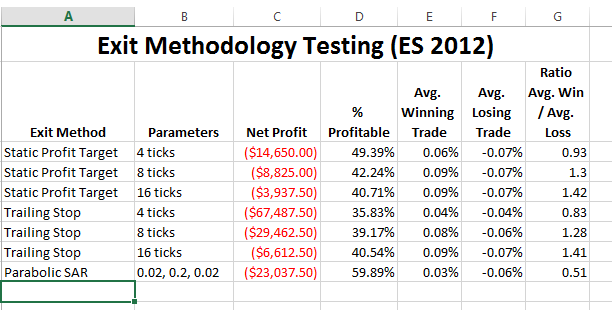 The best exit out of these tests were the static profit targets, but the trailing stop had a better increase in net profit between the parameter values. At this point,, you should have a great exit methodology for your entry. All that it is left at this point is to test a stop loss methodology, which we will look at in part 3 of this series.